This is a gorgeous vase! 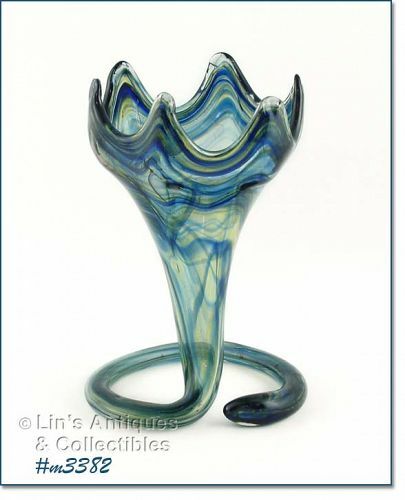 It measures 8 ¼” tall, 4 ¾” wide (at top widest), it’s a pretty light blue color with blue swirls, and the glass has some bubbles. Beautiful, eye-catching vase! This is an unusual chalkware set from Miller Studios -- it's a mirror with 2 wall pockets! Dated 1967, they are a soft white color with gold and brown antiquing/accents. Mirror measures 10 1/2" long, 9 1/2" wide (at widest). The matching wall pockets measure 5" long, 5" wide (at top) and they have the original pink plastic flowers in them! This little bunny couple is so cute! They are chalkware figures (wall plaques) made by Miller Studios and are dated 1981. Boy bunny is holding a bright orange carrot, girl is holding a bouquet of flowers. They measure 5 3/4" tall (at tallest) and both are very colorful. Mint condition and from my chalkware collection. 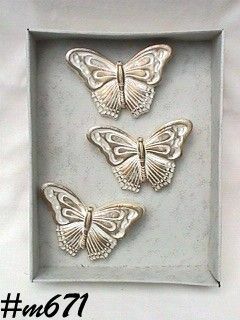 This listing has a set of 3 chalkware butterflies! Made by Miller Studios, butterflies are white with handpainted gold color decoration/accent. Each butterfly measures approximately 4 1/2" wide (from wing tip to wing tip), approximately 3 1/8" l ong (at longest part). These are in mint condition -- never removed from box.